By the time Christmas actually rolls around, I'm so done with the tree. It's just so messy. I vacuum daily but still the floor is perpetually coated in pine needles that get tracked all through the house. I'll be vacuuming them up into February, even though I will insist on taking the tree down on Saturday so that I can reclaim my living room. Just call me the Grinch. I do like the smell of the live tree, though, and it makes Paul happy to have a real tree. This year we didn't put a fence around the tree, and Pierce has effectively destructed a couple of ornaments. He has also spent a lot of time jumping on presents. Which leaves them partially unwrapped. 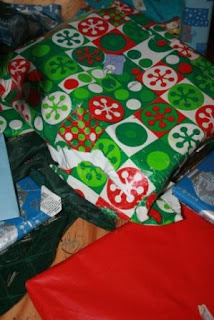 Which is okay, really, since I'm the world's worst wrapper anyhow. See all the pine needles on the floor? 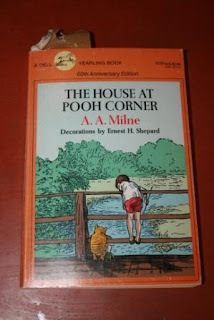 Yesterday we started The House at Pooh Corner. I found these two little figures that I got in Happy Meals (yes, I do eat Happy Meals - gotta love a few toxins, but in mini-doses of course) way back when The Tigger movie came out. I don't always save Happy meal toys, but for some reason these stuck around and I suddenly remembered they were in a tupperware in the basement. 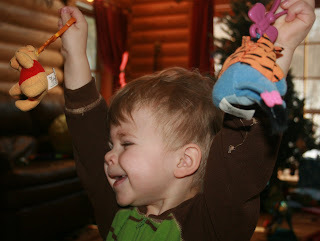 Pierce loves them and is a tiggery toddler bouncing around the house. All of this Winnie the Pooh led to him wanting to try honey. 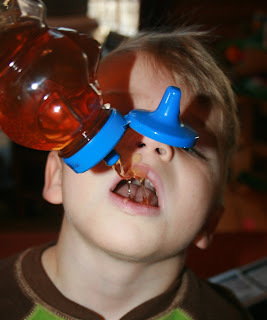 It's a little hard to take a picture AND pour honey down your toddler's throat. We both cracked up over me pouring honey all over his face. And here is a picture of the very busy Cort. 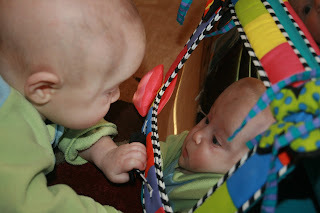 So far today I have done the usual vacuum, spot cleaned baby puke off the rug so the boys would have a clean place to play, mopped the living room and kitchen and one bathroom, cleaned one toilet, started split pea soup in the crockpot, fed the twins, and read a chapter of Pooh to Pierce. The daily tasks get sooooo old. Seriously. I hate cleaning. And the list of things that still need to be done are 5 times longer than what has already been accomplished. Oh, the drudgery of housework. What I really want for Christmas is someone else to clean my house for me. I am going to miss Ralph S. Mouse.